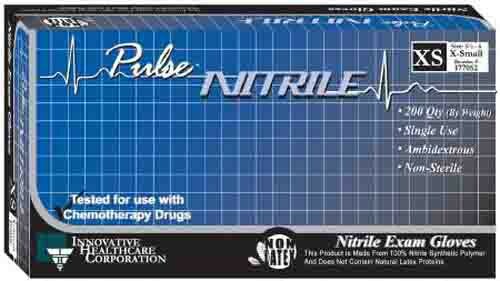 The Pulse Nitrile Exam Gloves Powder Free - NonSterile is a glove, compacted with nitrile, making it a lighter thinner version of most nitrile gloves currently on the market with an added benefit of being flexible than most. The thin design of the glove allows for better grip and precision when using tools such as syringes, giving you better response and control. 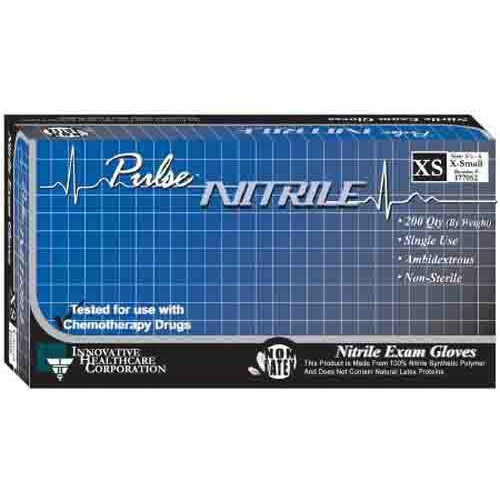 When using the exam gloves, make sure that such glove is made for the work you will be conducting, these gloves are rated for chemotherapy drugs, giving you safety when administering or handling chemo drugs that can cause health risks to people who do not need to intake the medication personally. The gloves are provided non-sterile, they are meant for office or hospital use but not for surgical procedures, you should consider sterile glove options if you need them for such procedures. The ambidextrous design gives you comfort when wearing the glove, creating a comfortable, forming feeling. The gloves are powder-free and do not leave residue when you remove them. Protection is extended by the 9.44-inches in length of the glove, covering past your wrist, closing gaps if wearing a smock.